I have just received your letter of the 31st. It was late. Your zero for the P 109 looked like a 6 and the letter was sent to several different sectors. I have also gladly received your letter of the 4th. Do not worry, the harvest will pay your expenses and you now earn more than you spend as you don’t have to send me money anymore as I am not spending. My health is still good. The weather is good. I have not seen Boca since I last came across him. I say goodbye. I leave you and kiss you with all my heart. Your devoted husband. 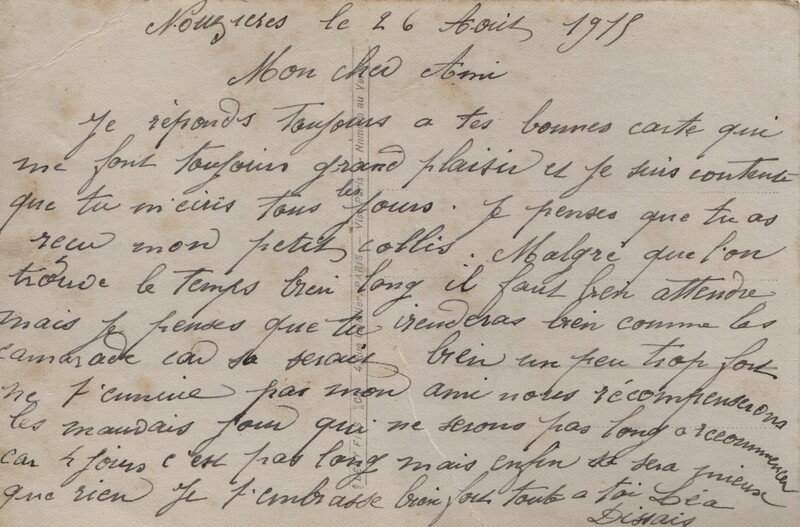 This morning I don’t have any news from you - hopefully nothing has happened to you as I should have had your letter from Easter - I am worried that you were in Rheims on that day that was so bad according to the newspaper. For myself I can’t live... if only I had [news] tomorrow. Today I have mounted potatoes the whole day in Beaulin. I am tired and swollen all over - I have to suffer as I haven’t got anyone. What suffering - if only one was worn out but did not have to carry this heavy burden night and day without seeing the end. I am going to bed 10 o’clock - we came back when it was dark. 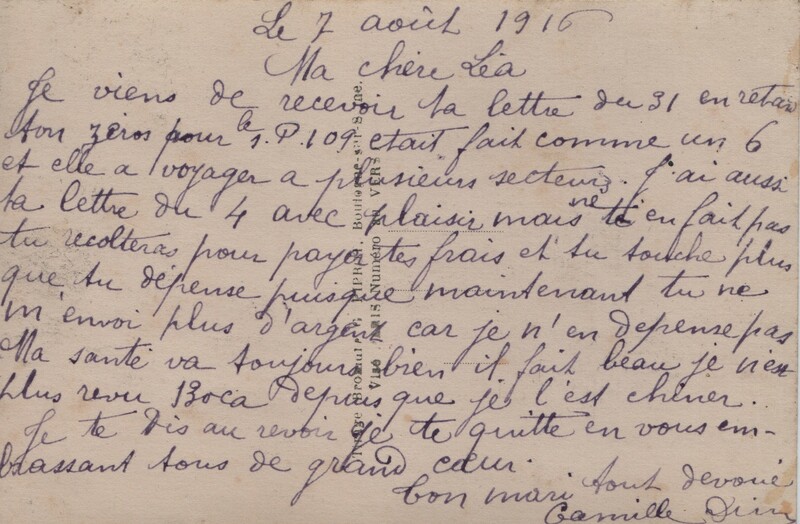 Note: Léa is probably referring here to the shell attacks on Reims (misspelled Rheims) that took place from Sunday 8 April until Monday 9 April 1917. More than 8000 shells landed on the town and by the end of the war the town of Reims had been under so much attack by the Germans that only 60 houses were left standing fit for habitation. The town was labelled “martyr town” and many postcards were circulated showing the catastrophic destructions suffered there. 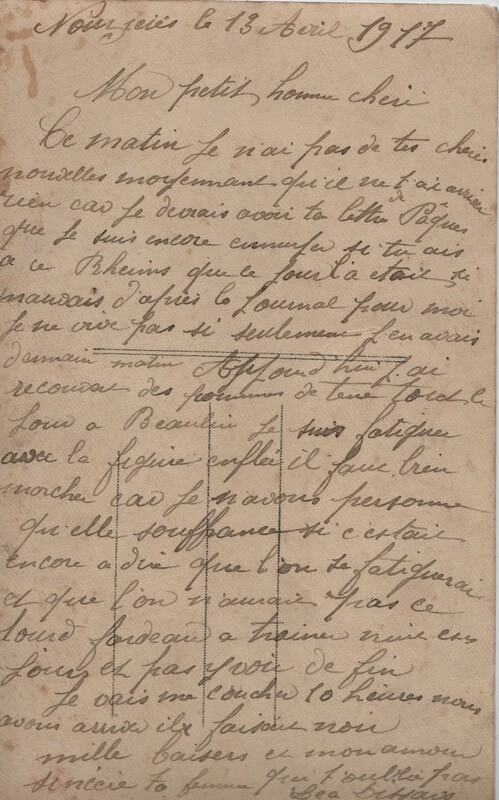 Léa’s husband was posted relatively near Reims (possibly in Crépy-en-Valois, 83 kilometres away) and she is obviously worried that Camille might have been caught up in the attacks. 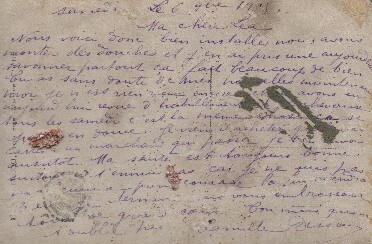 on the website group 14 card 19: the legend explains that the cathedral was bombed by the Germans and the doted line drawn on the postcard shows the place where the roof was standing before it was completely destroyed by fire during the attack. Legend: Friendship sows flowers on the path of life. Always so happy to receive your good news. Today I am still digging the potatoes and I feel very saddened with such sadness that I need to cry to relieve myself. I am afraid that it might be that perhaps you have caught something bad. Everyone is well. I wished you were even better. A thousand good kisses- your wife who only lives for you. 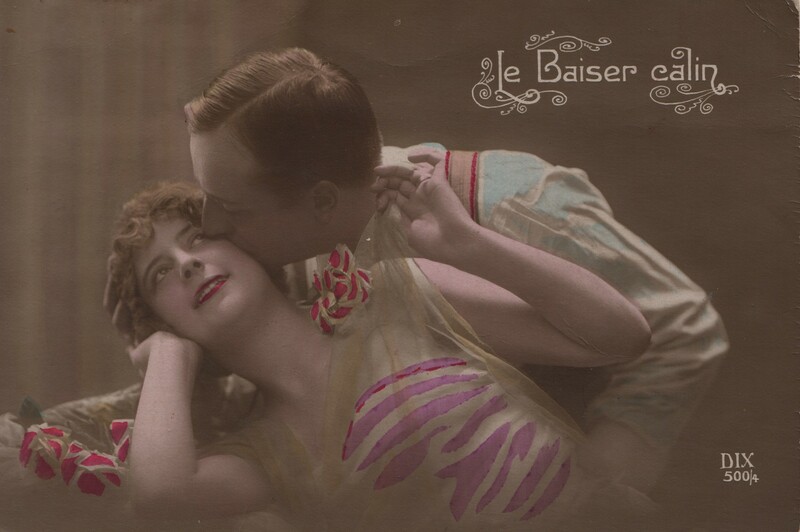 This postcard is very revealing of the anxiety suffered by the wives left at home: any bad dream or sudden anxiety attack is interpreted as a bad sign, a sign that something must have happened to their husbands. This postcard is not made of paper but with some sort of plastic. 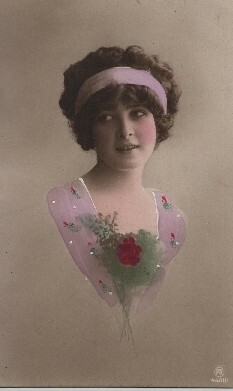 The year 1918 marks the beginning of the use of plastic for the manufacturing of common objects such as buttons, fashion jewellery, cigarette holders, pens. 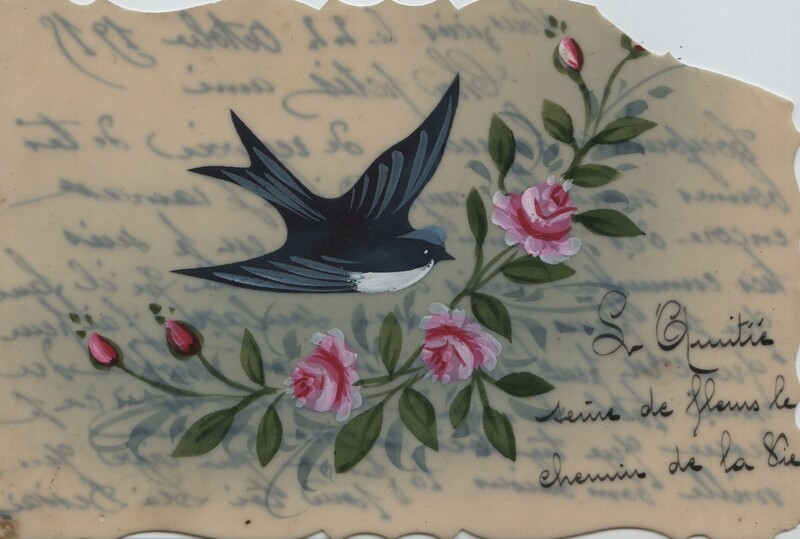 The postcard is beautifully hand-painted with a bird and flowers. Greetings and good health. Your cousin A Boux. We have just learned the sad news: cousin Camille Dancereau from Saint Georges has been killed by the Boches the class 20. He was in the trenches with cousin Morgeau and they were messing about jumping up and down. Then they [the Boches] saw his head and a bullet shattered his skull. He met his death. My heart has been bleeding since. Poor man [the father] has no more wife, lost a pretty little girl. 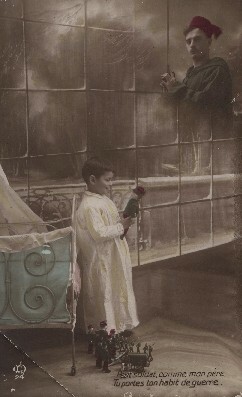 He had this boy in whom he had poured all his love as he had not remarried. And this damned war had to take away from him what was dearest to him. Why so much suffering. When will be the end of all that. Courage my friend. Your wife who does not forget you for one minute. The French says: ils s’amusaient a sauter- literally meaning they were having fun jumping. These young men were probably bored and enjoyed daredevil games. They played a head bobbing game in the trenches. Unfortunately this proved fatal for one of them. Life in the trenches was extremely demanding both physically and mentally. Many soldiers lost their mind. It may also be that these young men were so desperate that they did not care anymore about their lives and became careless. 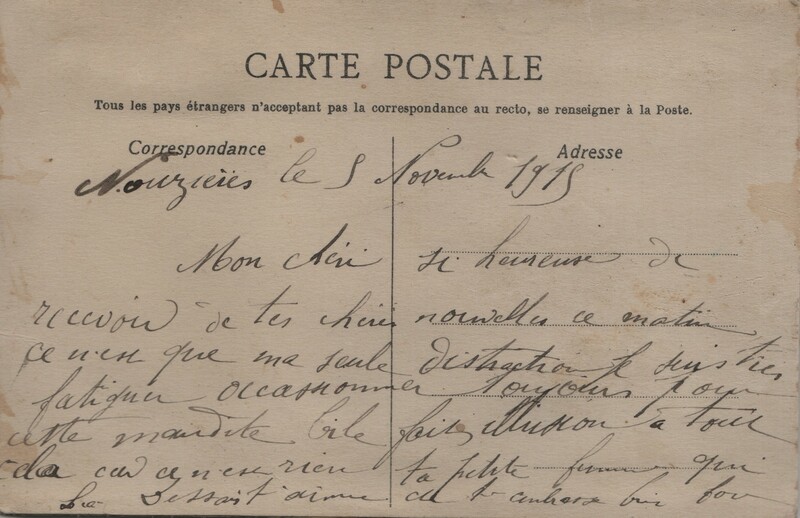 I have just received your card of the 19th and your good letter of the 19th with a lot of delay. Yesterday evening I went to bed at 8 so we ate the chicken this morning for lunch. It was excellent. It was about time as we only had soup and a little bit of beef. This evening we will have a goose. The rain is still falling sometimes […]. For the second time I send you my best wishes for the new year. Health is still good. My comrade Fournier has been awarded leave at the Etat Major. Nothing else for today except that I really would like to be a few days older to be next to you. I end with kissing you all very tenderly. We ate the chicken…: this might have been a chicken sent by Léa in a parcel? I really would like to be a few days older to be next to you..: Camille is most certainly going home on leave very soon and cannot wait to see his wife again. Receive from your papa his best souvenir and his affectionate kisses. 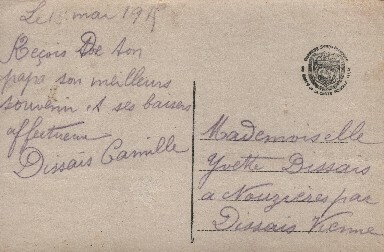 Note: The name of the family is Dissais and the nearer postal centre is also called Dissais (or rather Dissay- but Camille and Léa do not seem to make a distinction between the two spellings). All the mail arrives to Dissay, the nearest distribution centre, before being despatched to Nouzières. 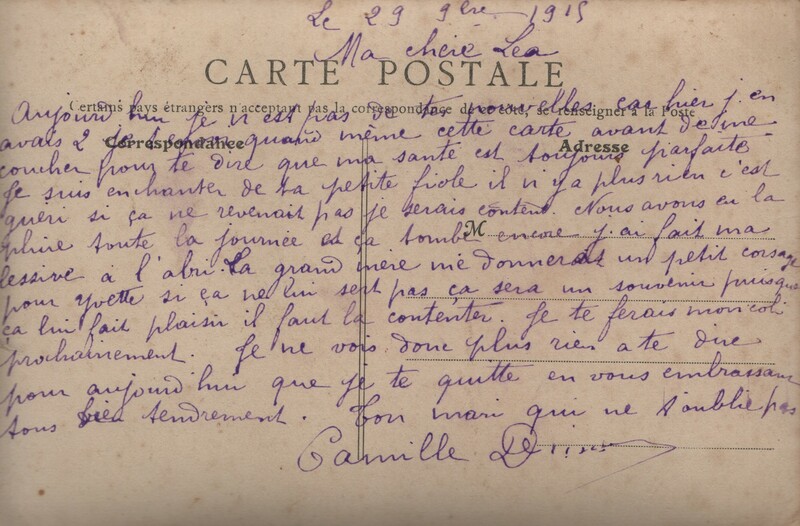 Although Camille writes to his wife most days, he also takes the time to maintain his relationship with his young daughter by sending her separate cards addressed to her alone. 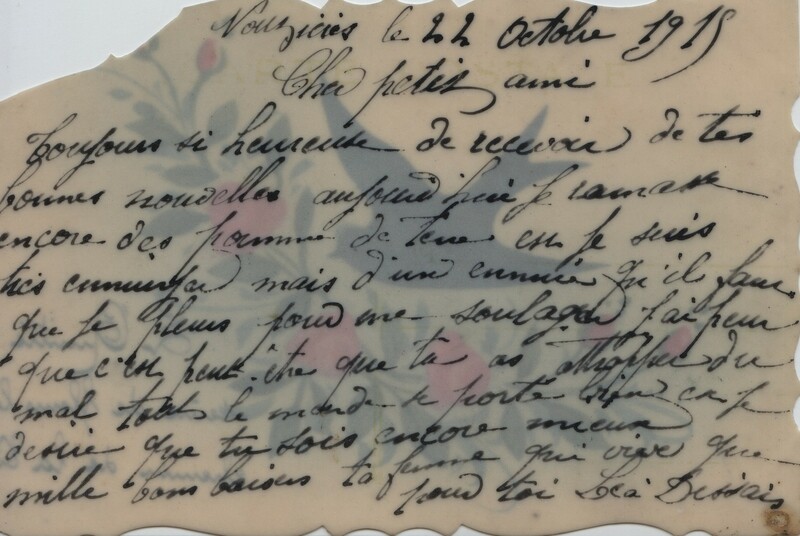 Note: The absence of written news is a great concern for families as they really don’t have any ways of knowing what is happening to their relatives on the front apart from the daily correspondence they receive (or do not receive like here). Legend: To have you next to me…. I answer your card dated of the 6th with pleasure but for your flanelle if that rips it is not worth spending much. Never mind in the first parcel I will send, I will buy some and I will do it myself. I will send it to you. I tell you again in my last letter I have put a mandate of 40 Francs. 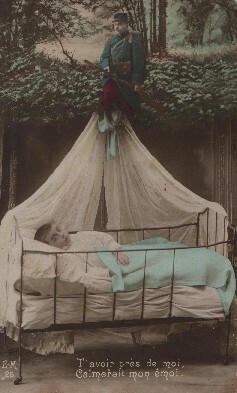 Today I am indisposed and that makes me feel very ill. This time I think that it is because of the washing. Receive my sincere greetings. Your wife Léa. 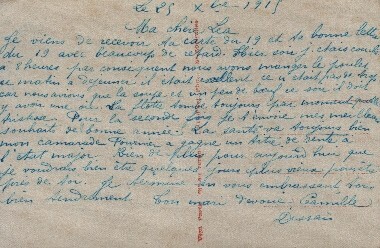 Note: Léa sends her husband 40 Francs. This is a lot of money for her as this represents more than the amount of the standard allocation militaire (35 Fr). A big financial sacrifice. Léa feels unwell. She blames it on the washing. 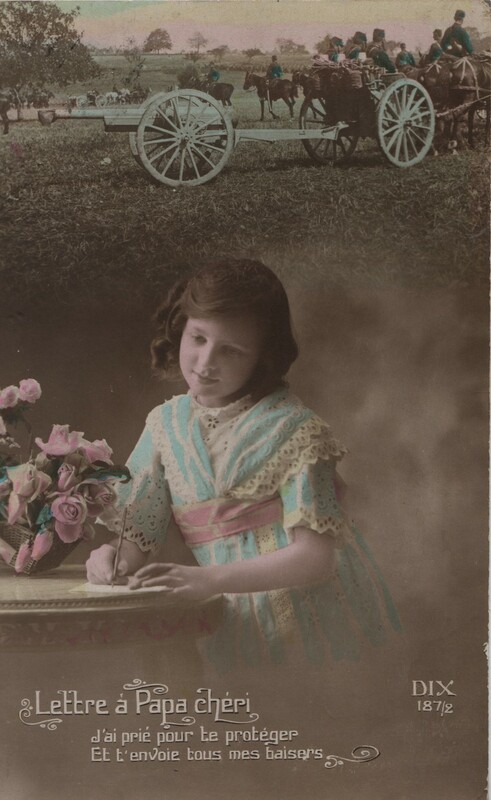 The cleaning of clothes and bed-linen was physically very demanding: no washing machines in those times. 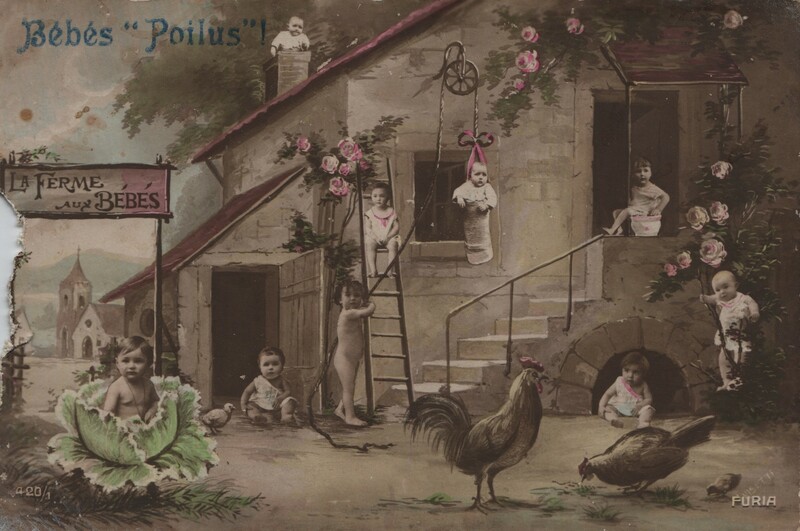 Women went to the lavoir (wash-house, often a specifically designed place on the nearby river). This was extremely hard work. 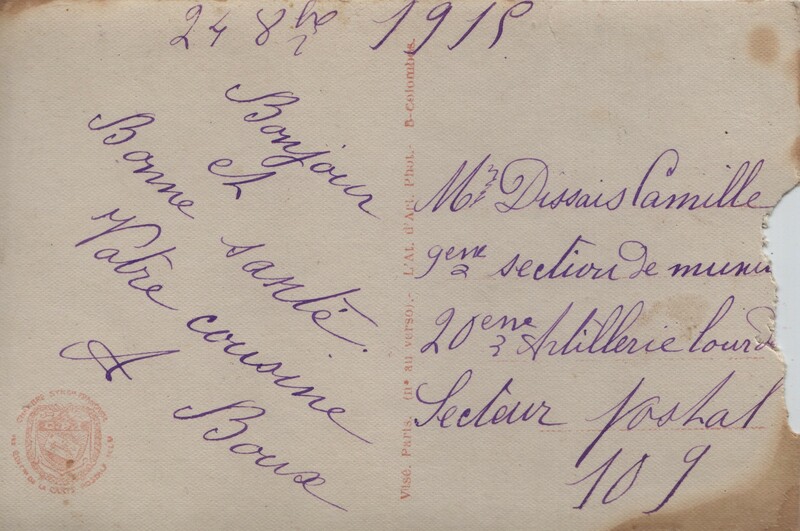 Léa, we gather from other postcards, also did the washing for other people as a way of earning a living. So here we are well settled down. We’ve put up some showers and I had one today. Soap everywhere. It feels very good. You probably have news from me now. For myself I haven’t yet received anything. We has a dress inspection today and one for horses. Every Saturday it is the same thing […] I have just bought a few cards from a seller that was passing. I am sending some right away. My health is still good.. 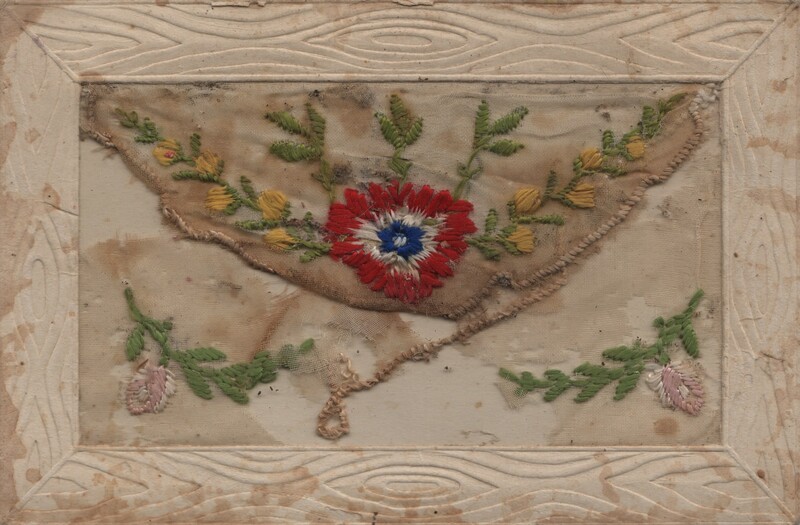 Note: This card shows how soldiers helped each other by visiting friends’ families when on military leave and carrying their little presents back to the front. 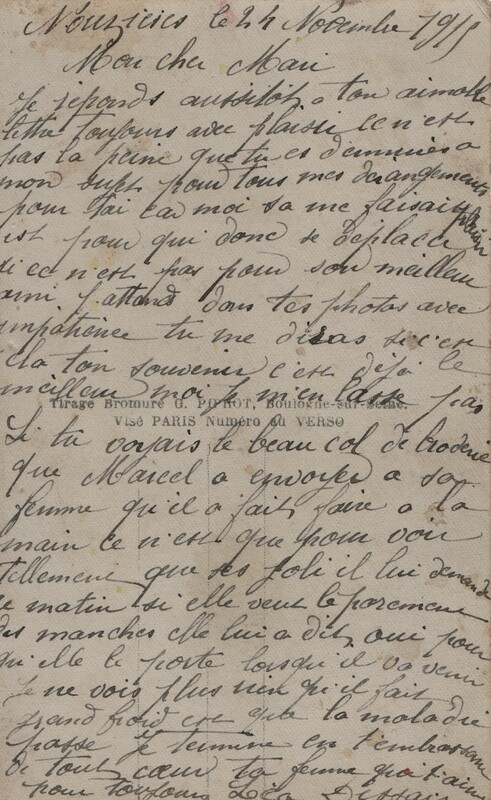 Léa notes that her husband’s friends come to see her but that they might not do so when the war finishes. The war seems to extend people’s social network as solidarity becomes key to survival. Today I haven’t got any news from you as I had 2 yesterday. Never mind I am sending you this card anyway before I go to bed to tell you that my health is still perfect. 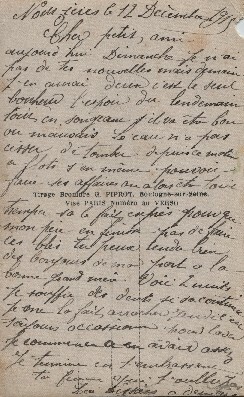 I am delighted with the little bottle- there is nothing anymore, it’s cured; I will be happy if it doesn’t come back. We had rain the all day and it is still falling. I did my washing under shelter. The grand-mère will give me a little blouse for Yvette; if she doesn’t use it, it will be a souvenir as that gives her pleasure- you have to keep her happy. I will send you a parcel very soon. I can’t see anything else to tell you for today except that I leave you by kissing you all very tenderly. Your husband that does not forget you. 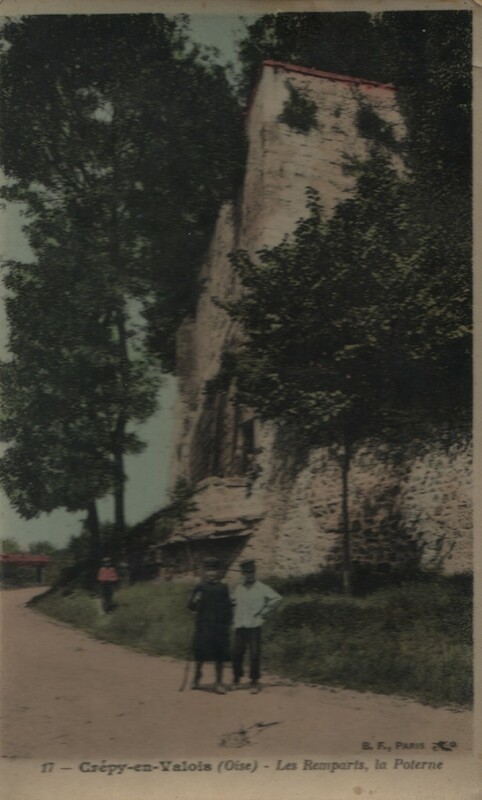 Note: The postcard is a picture of the ramparts in Crépy-en-Valois in the Oise region of France, north-east of Paris and quite close to the capital. It is also near Senlis where a major devastating battle took place on 2 September 1914; the Germans were marching fast towards Paris. 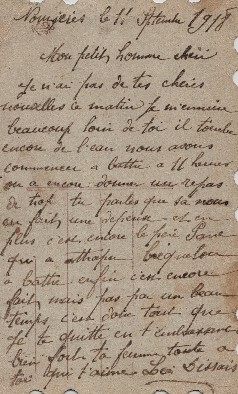 Four weeks only after the start of the war, they were less than 50 kilometres away from Paris. However they were stopped, pushed back, and from September 1914 until March 1917 the front line remained stable and positions were held. The Oise region was a strategic area as it was the gateway to the capital, the door-step of Paris. 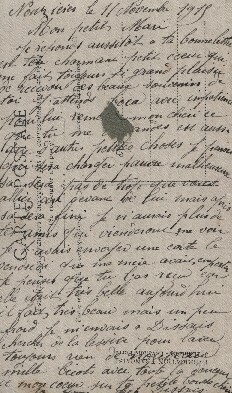 Camille might have been posted somewhere near Crépy-en-Valois. Keeping clean and healthy was a challenge for the soldiers. 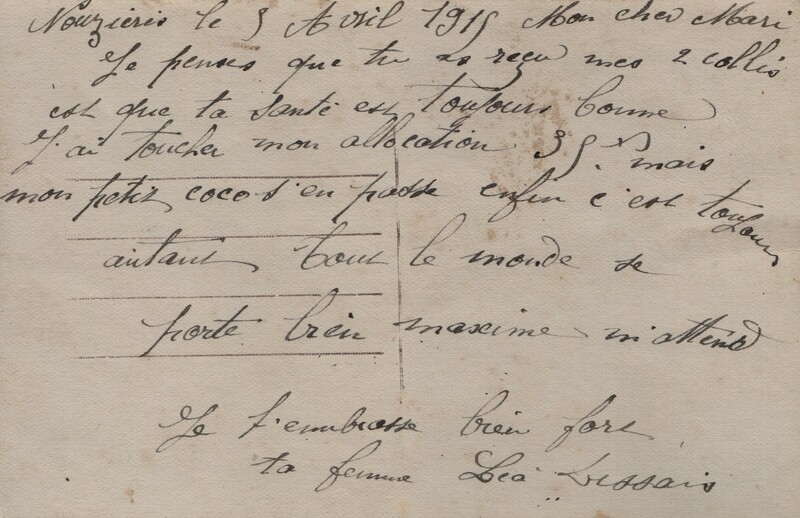 It seems here that Léa might have sent Camille some medicine to help cure some ailment. 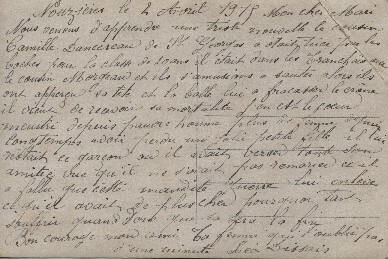 Camille has to do his own washing; drying one’s clothes must have been a challenge, especially in the north of France where the rain is a very common occurrence. I am replying to your kind letter immediately- always with pleasure. There is no need to worry about me. About my inconveniences for you- I really was happy to do it and for whom would you travel if not for your best friend. So I am waiting for your photos with impatience. You’ll tell me if that’s your memories- that’s the best. I never have enough of it. Note: It seems that Léa might have travelled North to see her husband and that they had a chance to spend some time together and take photos. Léa’s precious memories of these moments spent together are something very important to her. 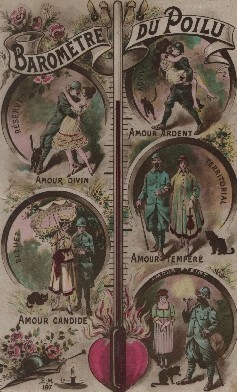 This postcard shows some of the strategies used by couples to keep their relationship alive in spite of the long-term separation. 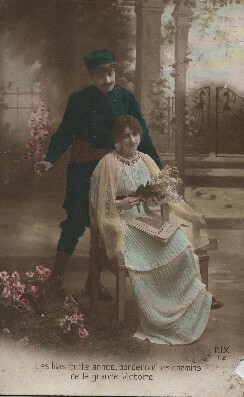 The exchange of presents through the post was an important way for spouses to show that they cared for each other. Marcel obviously did very well and got just the right thing! Maybe a hint from Léa to her own husband? 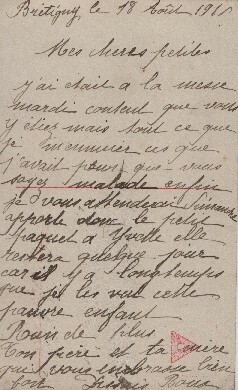 It is interesting to see here that Léa writes in the present tense “he is asking her this morning if she wants the matching sleeves” (il lui demande ce matin….). She can write in the past and does use the past tense further on. 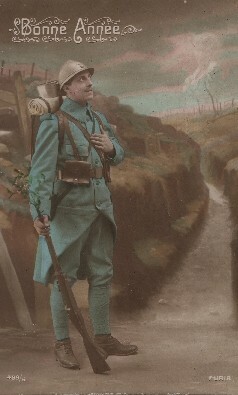 Marcel is not with his family; he is on the front. However you do get a clear feeling that for the women left behind, the post they receive every day is a real presence and a real daily interaction with their spouses. 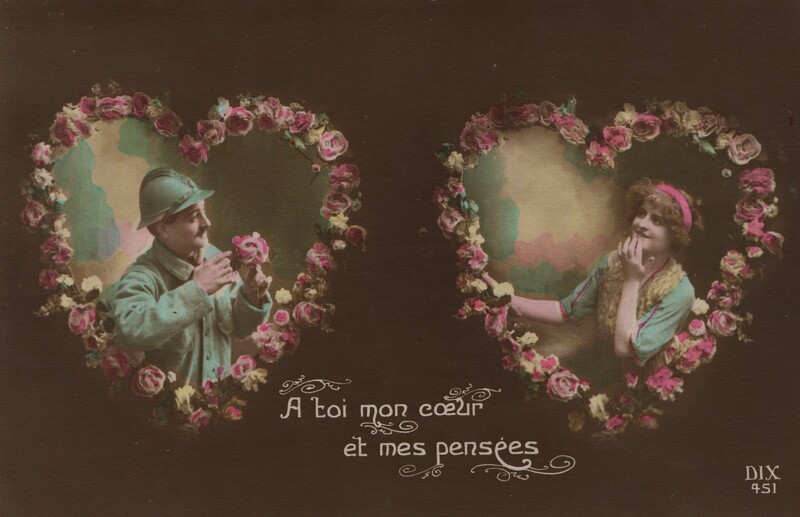 The postcard comes to embody the faraway spouse. Legend: Daddy will be a hero ... I want to go too! I think that you must have received my 2 parcels and that your health is still good. I have received my monthly allowance of 35fr but the little darling has to do without- never mind it’s something anyway. Everyone is well- Maxime is waiting for me. 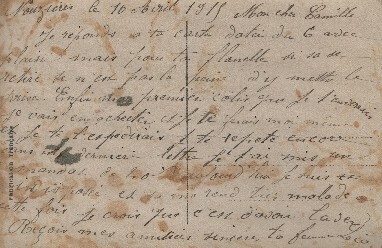 Note: Léa went to the town of St Georges in February to claim the allocation militaire, a monthly grant distributed by the French state to families of soldiers who needed financial support. 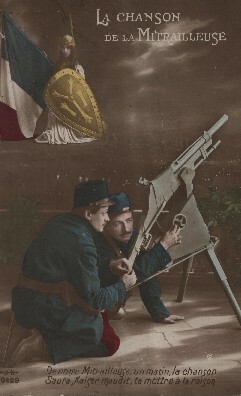 This happened as early as August 1914 (law of 5 August 1914) and shows that the French government immediately took action to financially support the families of soldiers. There was a real danger that these families, who often solely relied on men’s incomes, would fall into terrible poverty. A daily grant of 1.25 Fr per adult was allocated together with an extra 50 centimes for every child below the age of 16. 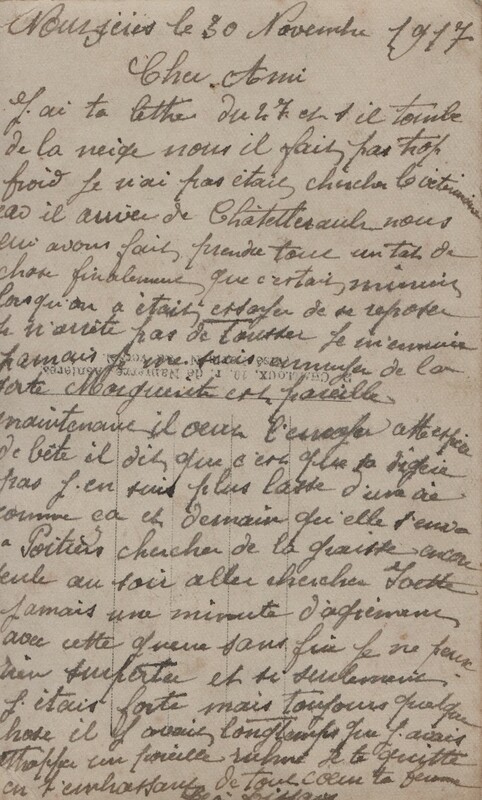 These 1.25 Fr could buy you a standard white bread loaf (3kg). This was the fixed price for this sort of bread in 1914 as reflected in many Arrêtés Municipaux (official statement issues by Town Hall to fix the prices of basic food items). 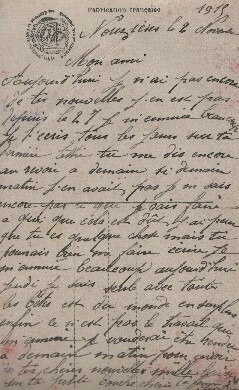 In August 1917 the daily grant to needy families was increased to reach 1.50 Fr for adults and 1 Fr for a child. This was most certainly done in line with the strong inflation. The prices of basic food items increased by more than 50% between 1914 and 1916 and continued to rise even more sharply after 1916 to reach twice what they were before the beginning of the war. 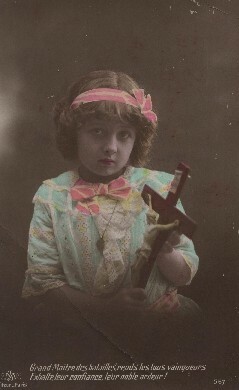 The state had to respond to this price increase and, most importantly, the daily grant for children from needy families was doubled to reflect the need to protect the future of the nation: there is a sharp drop in birth rate during the war due not only to separation but also to the conscious decision by couples to wait for better times to extend their families. On the demographic impact of the war see Paul Vincent, Conséquences de six années de guerre sur la population française in Population, 1e année, n.3, 1946, pp. 429-440 (available on Persee.fr). On food prices see Jay Winter, Nourrir les populations in Encyclopédie de la Grande Guerre 1914-1918 (ed. S. Audoin-Rouzeau and J-J Becker, 2004). See also Group 2 card 10. 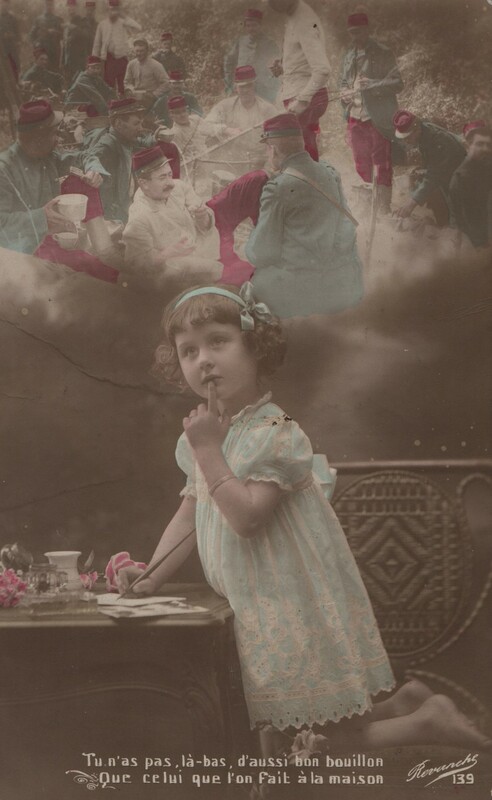 About the image on the postcard: the photo shows a little girl praising her father and expressing her own desire to go to the front. Of course women were not allowed to fight but they did serve as nurses and in many other caring roles (hence the red cross on the girl’s arm). 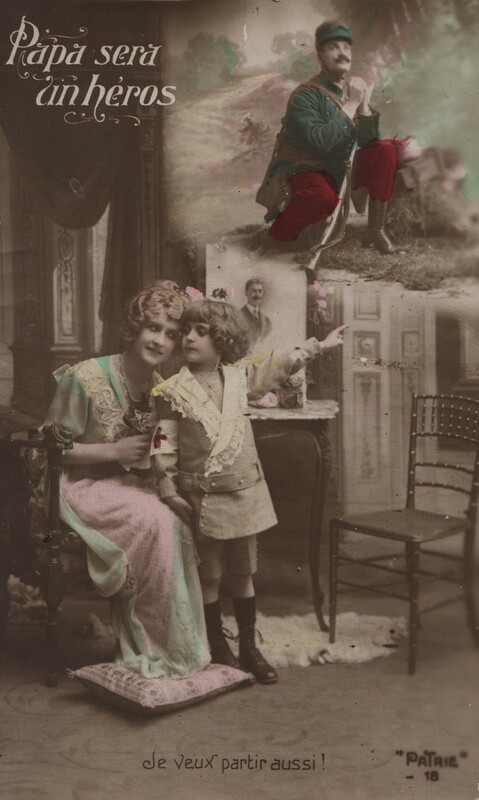 Some of the postcards presented here promote the image of the child-hero: boys are depicted as future soldiers (wearing miniature versions of the uniform) and even babies are given military makeovers. The child-hero is generally a boy (or a sexless baby)- not a girl. 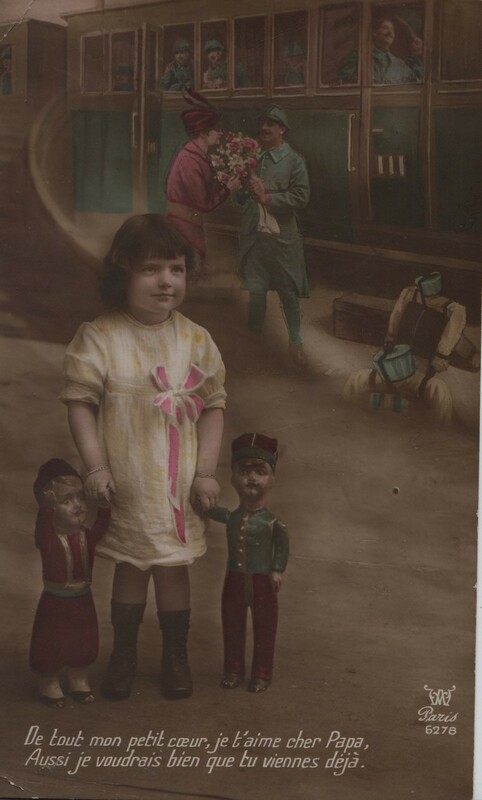 This postcard is maybe a little bit unusual here as the little girl is presented as a potential hero, rather than a stay at home supportive figure who will follow in the footsteps of her mother. However, generally speaking, war propaganda did insist on the fact that all, young and old, boys or girls, men or women, needed to take part in the war effort. 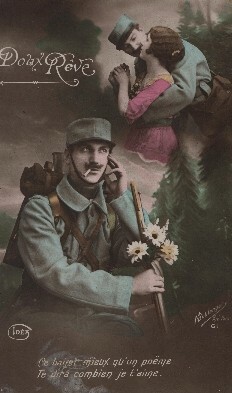 On war culture and the image of the child-hero see Manon Pignot, Les enfants, in Encyclopédie de la Grande Guerre 1914-1918 (ed. S. Audoin-Rouzeau and J-J Becker, 2004).